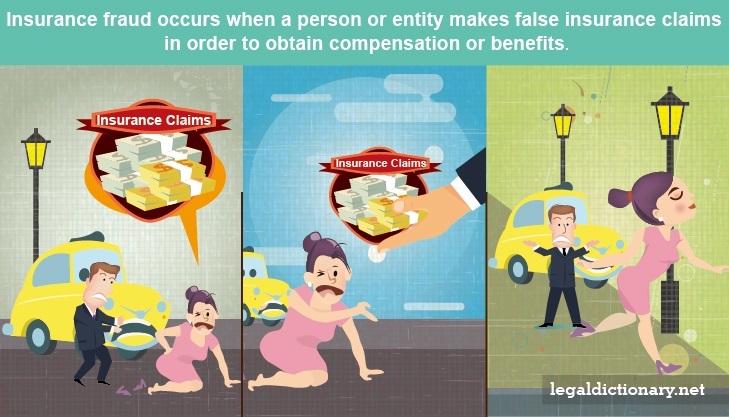 Insurance fraud occurs when a person or entity makes false insurance claims in order to obtain compensation or benefits to which they are not entitled. Insurance fraud is committed in many forms, but regardless of the type, it is considered a serious crime in all jurisdictions. To explore this concept, consider the following insurance fraud definition. The wrongful or criminal deception of an insurance company for the purpose of wrongfully receiving compensation or benefits. The term insurance fraud refers to the commission of any act with the intent to obtain an outcome that is favorable, but fraudulent during an insurance claim. Insurance fraud may entail a person filing a false insurance claim altogether, or exaggerating their damages, injuries or other losses in order to receive benefits. Many people fail to consider that insurance fraud can also apply to an insurance company knowingly denying benefits that are, in fact, due. The primary reason that people commit insurance fraud is to gain financially. Many people who maintain an insurance policy year after year come to believe that, because they have paid premiums for so long, they deserve to be compensated in the form of an insurance claim. Sometimes the claim is legitimate, but the person will tries to increase the amount of compensation by claiming more severe injuries or greater losses than actually occurred. In some instances, people even destroy their own property, if the payment they expect to receive from their insurance company holds a greater value to them. There are many types of insurance fraud, but the judicial system often categorizes them as either hard fraud or soft fraud. Hard fraud occurs when a person intentionally fakes an accident, theft, or injury to collect money from an insurance company. For example, Tom has been unemployed for several months, when his old clunker car breaks down. Desperate for money to replace his car, Tom decides to make it look like someone broke into his house, then made a police report claiming theft of several expensive items. This type of hard insurance fraud is common, and is one reason insurance companies employ an insurance fraud investigator. Hard fraud cases almost always results in felony charges. Soft fraud occurs when a person has a valid insurance claim, but falsifies part of the claim, or exaggerates damages in order to obtain the maximum benefits. Many people do not consider this to be as serious as hard fraud, but it is still a crime, and can result in increased insurance costs for clients. For example, Elizabeth is involved in a minor collision when someone backs into her car in a parking lot. There is substantial damage to one part of her car, and she is uninjured. When it comes to filing the insurance claim, however, Elizabeth reports having neck and back pain, and even seeks treatment by a chiropractor to support her claim of injury. In this type of soft fraud, Elizabeth has a valid claim for damages to her vehicle, but she claims personal injury in an attempt to receive a higher payout. The exact amount of money lost due to insurance fraud cases is hard to determine, as the crime often goes unnoticed. The number of fraud cases that are actually caught is believed to be much lower than what actually occurs. Some organizations estimate that over $80 billion are lost each year to fraudulent insurance claims in the United States alone. It is estimated that approximately 10 percent of the insurance industry’s total annual losses are due to fraudulent claims. The high cost of fraudulent cases is passed down to insurance customers in the form of higher premiums, as the insurance companies try to recoup some of those losses. Life insurance fraud occurs when a person fakes their own death, or the death of another person, in order to receive life insurance payments from the insurance company. This type of fraud usually involves two or more people. When the life insurance company is notified of a death, the named beneficiary receives the insurance settlement. Many people committing life insurance fraud resurface years after the assumed death took place. If the person is caught, the person who aided in the life insurance fraud scheme is charged with the crime as well. Life insurance fraud would be considered hard fraud and, because of the dollar amounts involved, is a felony. Another common form of insurance fraud occurs in the health care industry. Health insurance fraud is the act of deceiving, misrepresenting information, or concealing information with the intent to receive benefits. Both patients and providers can commit health insurance fraud. When patients commit health insurance fraud, it is usually by falsifying or altering forms, concealing pre-existing conditions, or failing to report information. Health care fraud does not end with individuals and healthcare providers however, as health insurance companies themselves are known to have committed fraud. They do this by deleting claims from their system, not paying claims, and denying coverage even if the person meets the criteria. Due to the amount of healthcare fraud that exists in the United States, Congress enacted the Health Insurance Portability and Accountability Act, more commonly known as “HIPPA,” which makes healthcare fraud a federal offense with serious penalties, to discourage people, providers, and insurance companies from committing fraud. Auto insurance fraud is a commonly perpetrated fraud in the U.S., occurring when people fake traffic accidents, inflate claims, and even fake auto-related deaths in order to receive auto insurance payouts. Insurance investigators have even discovered some insurance adjusters getting in on the act for a fee. Perpetrators of auto insurance fraud use a variety of tactic, such as braking sharply in traffic to intentionally cause the car behind them to hit them in the rear. These fraudsters then claim that the other driver was at fault, and make a claim for damages to their vehicle, as well as to injuries that don’t exist. Another tactic used by those who engage in insurance fraud is jumping in front of a moving car and claiming that the car hit them. Often, when unintentional accidents occur, and the victim will exaggerate their injuries to receive more money. They may even claim that the accident caused injuries that were in fact, caused by something else, in order to get their treatment paid for by the auto insurance company. For example, Armando waits in a busy parking lot for someone who is obviously distracted to back out of a parking space. While the individual is backing up, Armando slips in behind the car, banging loudly on the rear, then falling down to the ground. Armando claims the driver did not look before backing, and pretends to have several serious injuries which require medical care. This type of claim for injury caused by negligence could bring a large payout in this type of fraud. Property insurance fraud occurs when an individual either destroys, or makes a false report of theft of, personal property items, a structure, or even a vehicle, in order to obtain benefits from the insurance company. This is usually done because the individual is strapped for cash, and the insurance payout is often greater than what the property would be worth to simply sell it. Additionally, when someone reports property loss or damage, they too inflate the claim, reporting property they never had, or reporting items as being a better brand, and newer than they actually were. The most common type of property insurance is a loss of a home due to arson. This may be because the insurance covers, not only the structure, but all of the property contained inside. An insurance fraud investigator may be employed by insurance companies or other agencies, such as the fire department or local police. Some private investigators also investigate insurance fraud, and can be hired by individuals. Insurance fraud investigators are trained to look for specific signs that indicate fraud has occurred. Insurance adjusters who have some suspicion that a claim is fraudulent often have the company’s insurance fraud investigator look into the circumstances of the claim before making a payout. Investigation may continue, or even begin, after an individual has received compensation from the insurance company. Penalties for insurance fraud cases vary, depending on several factors of the claim, including the amount of loss due to the fraudulent act, and the laws of the state in which it was perpetrated. Soft fraud is classified as a misdemeanor in most states, and may be punishable by a year or less in jail, fines, community service, and probation. Hard fraud, on the other hand, is a felony, with more severe punishments, such as more than one year in the state prison, large fines, and restitution. Many fraud causes contain elements of other crimes which can result in multiple criminal charges. In the early 2000s, Dr. David Wexler, a dermatologist practicing in New York City, paid drug addicts to allow him to use their names for fake insurance claims. The doctor billed insurance companies to the tune of over $400,000 for minor surgeries he never performed. In addition to small monthly kickbacks, the doctor provided a large amount of narcotic medications to the addicts to keep them coming back. Wexler was convicted and sentenced to 20 years in prison, and faced a fine of up to $1 million. In 2007, Chicago grain-futures mogul, Marc Thompson, found himself in debt to the tune of nearly $680,000. Thompson decided to burn down his house and collect the insurance money. To make the fire seem more plausible, Thompson carried his 90-year old mother down to the basement, splashed an accelerant around the walls, and set the fire. Thompson’s mother died in the fire, after which he claimed she had committed suicide by torching the house. When investigators looked into Thompson’s finances, they discovered the debts, which were not completely covered by the $600,000 insurance payout. They then found that Thompson had stashed the insurance money in an offshore bank account, then filed bankruptcy, wiping out that debt, leaving him with the proceeds of his fraud. Thompson was eventually charged with arson, fraud, and a host of other serious crimes. After conviction, Thompson was sentenced to 190 years in federal prison. In May 2004, Carla Patterson and her son went to the Cracker Barrel restaurant in Newport News, Virginia, for Mother’s Day lunch. After being served soup, Patterson screamed loudly, saying she had found a dead mouse in her bowl of vegetable soup. Her son quickly snapped several pictures of the dead mouse, and alerted the news media, whose reports led to such a drop in the restaurant’s patrons that it nearly went out of business. Patterson filed a lawsuit against the restaurant, attempting to get a $500,000 payout. Investigators, through extensive investigation and testing, proved that the rodent had been placed in the soup after it had been cooked, leading to charges of insurance fraud, among others. Although the Patterson’s scam deeply affected the restaurant’s employees, many of whom had their hours cut, or lost their jobs altogether, Patterson was sentenced only to a year in prison. Last year I had an MRI of the LS spine. I was self-pay at the time. The charge for the test was $220. Fast forward one year. I had a repeat MRI of the LS spine. This time I had United Healthcare coverage. The bill came to $2000. UHC paid $1600, and I received a bill for another $300. How is that okay? How can the charge be so inflated for a covered patient?? If this is not the correct forum, can you refer me to someone who can help me understand? My husband’s ex-wife put in their divorce decree, 5 years ago, that my husband had to pay 1/2 of any medical that insurance doesn’t cover. He didn’t know at the time that she has the high deductible plan, so along with that her employer puts $100 a month in to an HSA. She contributes zero. She goes to the doctor, sends my husband the bill to pay half, then pays for it with her HSA account. What type of fraud is this? She also sends all the receipts to him through the mail.